Cadet Officer: Wing Sergeant Major at Douglas. 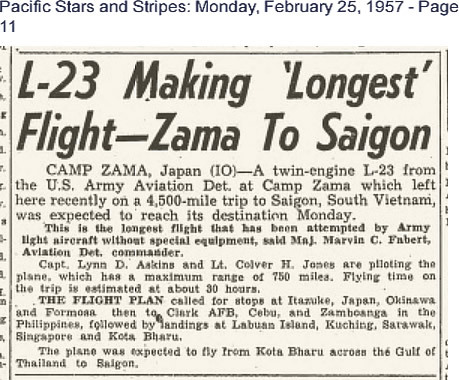 He was still in the service in 1957 when he was making a record long flight in a L-23 without special equipment. 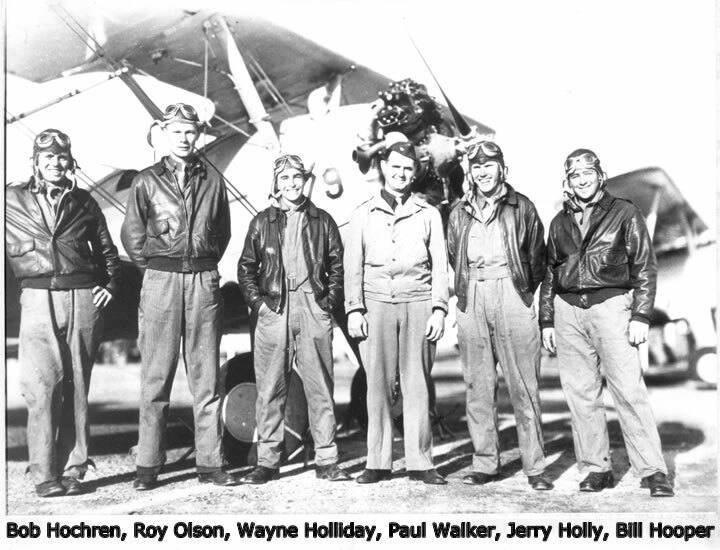 Click here for an article about the flight. Died March 16, 2002, Age 83. O. E. Pierce was his instructor at Douglas. He was in the 301st Bomb Gp. 352nd Bomb Sqdn. On May 25, 1944 he was pilot of a B-17G that was hit and broke into 3 pieces. All crew members were killed. (MACR #15163). He is buried in the Sicily-Rome American Cemetery and Memorial (see Find-A-Grave). Nettuno, Lazio, Italy. Air Medal with 2 oak leaf clusters. Click here to see a picture of him with his instructor and fellow cadets at Douglas. J. B. Knox was his instructor at Douglas. S/N: O-808937. He was in the 463rd Bomb Gp. 773rd Bomb Sqdn. On May 18, 1944, he was pilot of a B-17G (S/N: 42-31791) with a crew of 10 on a bombing mission to the Ploesti Oil Fields, Romania. Enemy fighters, 5 abreast, came in a frontal attack, then peeled off and followed each other in their attack. Bollei’s plane was hit. All 10 crew members bailed out about 10 miles from the Danube River. All crew members returned to duty (MACR #5834). MACR #6725 of June 7, 1944. J. B. Knox was his instructor at Douglas. S/N: O-808948. He was in the 306th Bomb Gp. 367th Bomb Sqdn. flying B-17’s. He was killed in a flying accident over the Channel on Apr. 14, 1944, per Steven Burris. He was a bombardier on B-17’s in the 92nd Bomb Gp. 325th Bomb Sqdn. On Apr 11, 1944 he was interned in Sweden, per Steven Burris. Born Oct. 29, 1918 Ocala, FL. S/N: O-806979. He was in the 96th Bomb Gp. 339th Bomb Sqdn. On May 1, 1944, he was the pilot of a B-17G (S/N: 42-31152) with a crew of 10 on a mission to the Metz rail yards in France. After the plane was hit by flak, he bailed out over Ath, Belgium. He and some of his crew evaded capture by being taken in by the Belgium Underground. He aided the underground until the home they were hidden in was raided by the S.S. He became a P.O.W. Eventually he was liberated. However his tail gunner, Gerald E. Sorenson, who was also picked up by the Belgium Underground was killed fighting a rear guard action (MACR #4237). Click here for more information. He graduated in the bombardier class of 44-11 at Victorville, CA and became a bombardier, S/N: O-752607. S/N: O-808966. He was in the 463rd Bomb Gp. 773rd Bomb Sqdn. On Apr. 30, 1944, he was co-pilot of a B-17G (S/N: 42-31805) with a crew of 9 on a mission to Varese, North Italy. Their plane was hit by enemy anti-aircraft and lost all power. The plane was set down in a heavy sea with a strong wind about 20 miles SE of Ancona. The plane stayed afloat for about 30 minutes and the men got into 2 life rafts, although the rafts did not inflate properly and the crew struggled and became separated. One of the crewmen perished in the water. After 16 hours, the raft not carrying Donner was spotted by British Spitfires and 2-4 hours later they were picked up by a British flying boat. However the British flying boat was damaged in landing and had to taxi to friendly territory. While taxiing they were shelled by heavy artillery. Upon reaching land, they were given medical aid but were only 1 mile from the front line. British trucks took them to Celono, Italy, their home base, and they arrived on May 1, 1944 (MACR #4606). Donner’s life boat was captured Apr. 30, 1944 and he was a P.O.W. until the end of the war. Click here for a picture (Duffield is on the left). S/N: O-808242. He was in the 16th Fighter Gp. 24th Fighter Sqdn. He was killed in a flying accident 1944-01-25 in Panama. He graduated in the bombardier class of 44-13 at Victorville, CA and became a bombardier. O. E. Pierce was his instructor at Douglas. He was in the 463rd Bomb Grp, 772nd Bomb Sqdn flying B-17s in the European Theater when he was a witness in a Missing Air Crew report (MACR 5827). O. E. Pierce was his instructor at Douglas. He graduated from Columbus, Miss July 1943, S/N: O-807402. He started training as a pilot for the Royal Canadian Air Force (RCAF) as he did not have a college degree and was not eligible for US pilot training in the USA Army Air Force (USAAF) prior to US involvement in WWII. •	April-May 1943 – Gunter Field, AL. While there he flew the following planes: BT-13, B-17 and B-24. •	June-July 1943 – Columbus, MS. While there he flew the following planes: Curtis AT-9 Beech AT-10, AT-6 and A-20. •	January-February 1944 – Memphis, TN – Army Air Force ATC. While there he flew the following planes: C-47, B-24, P-70, B-26, B-25, P-47 and P-51. He also flew a lot of cross country while stationed there. Before he left there he earned a class 5 rating which meant he could fly everything but the B-29. •	In May 1944 he went overseas and was in the 3rd CCG (Combat Cargo Group), 10th Air Force in the CBI theater flying cargo planes. 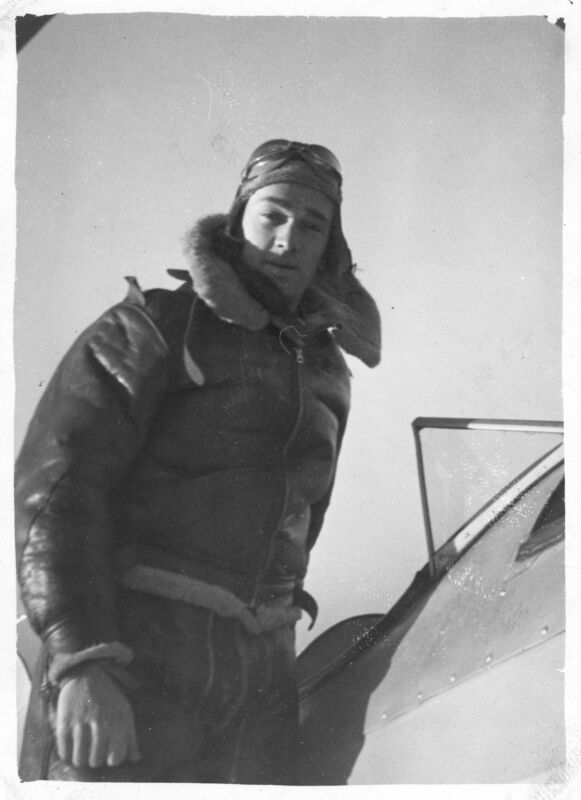 He received the DFC for flying more than 100 hours over enemy held territory in northern Burma. He was born January 1, 1920, to Daniel E. Featherstone and Alice Featherstone. He graduated from Lincoln High School in Ferndale, MI, in 1938. He married Stella Elizabeth Thomas in March of 1945. They had three children. After the war he had a number of sales positions, including Burgmaster Corporation. He passed away on December 22, 1967 as a result of a private plane crash in Knox, Indiana. Click here for a picture in his flight gear. Click here to see a picture of him after soloing on Mar 9 1943. Click here to see a picture of him with his friends, Jenkins and Johnson, at Douglas. Click here to see a picture of him in cold weather gear, at Douglas. Click here for a picture (Feldy is on the right). S/N: O-808976. He was in the 465th Bomb Gp. 782nd Bomb Sqdn. On Aug. 3, 1944, he was the pilot of a B-24H (S/N: 42-95284) with a crew of 10 on a bombing mission to Friedrichshafen, Germany. The plane was attacked by enemy fighters, the plane crashed and the entire crew was killed. He graduated from Spence Field, S/N: O-808246. He was with the 324th Fighter Gp. 316th Fighter Sqdn. Cadet Officer: Wing Adjutant. He was in the 306th Bomb Grp, 423rd Bomb Sqdn and flew B-17s out of England. (See mission report where he is listed as leading the low squadron). Of Playa Del Ray, CA. S/N: O-808980. He was with the 448th Bomb Gp. 714th Bomb Sqdn. (MACR #4177). On Dec. 30, 1943, his B-24H (S/N: 41-28599) was shot down over Belgium and was killed. He became a navigator/bombardier, S/N: O-698693. He was in the 497th Bomb Gp. 871st BS (VHB), per The Long Haul: The Story of the 497th Bomb Group and other sources. Graduated from Spence Field, S/N: O-808252. He was in the 413th Fighter Gp. 1st Fighter Sqdn. / Millville AAFd Replacement Training Unit, per Steven Burris. He became a navigator, S/N: O-702407. He was in the 5th Bomb Gp. 394th Bomb Sqdn. On June 18, 1944, he was navigator on a B-24J (S/N: 42-73454) on a mission to Momote Airfield, Papua New Guinea. The target was closed in, there was heavy but inaccurate flak, and there were some enemy fighters in the area. But it is not known why the plane crashed, but the entire crew was killed (MACR #6581). Cadet Officer: Commander Squadron B. Starting in June 1944, he served as a B-17 pilot in the 364 Bomb Sqdn, 305 Bomb Group of Podington, Bedforshire, leading 37 missions over Europe. – See obituary at http://www.legacy.com/obituaries/washingtonpost/obituary.aspx?n=jerome-greenberg&pid=165687406 . His bomber was named “Mag the Hag.” See p. 10 of this newsletter. For many years he volunteered at the National Air and Space Museum. Died June 28, 2013 Age 96. S/N: O-812806. He was in the 359th Fighter Gp. 369th Fighter Sqdn. He became a bombardier, S/N: O-689152. He was in the 459th Bomb Gp. 757th BS (ZI), and was killed in a flying accident Jan 14, 1944, per Steven Burris. He had Basic at Günter, Ala. in BT-13’s and Advanced at George Field, IL in AT-10’s. S/N: O-808993. He graduated in June 1943. He and Hillman followed the same career. Went overseas to San Pancrazio, Italy, in 376 Bomb Group (H), 512 Bomb Squadron as co-pilot. On July 3, 1944, he and Hillman on their 50th mission were hit by flak over Giurgiu, Romania south of Ploesti. He and Hillman bailed out. They were P.O.W.s for 67 days. They were released together through Turkey and Egypt. He returned to the States to fly B-25’s. He made 1st Lt. in June 1944. Was delayed to class 43H. He had Basic at Günter, Ala. in BT-13’s and Advanced at George Field, IL in AT-10’s. S/N: O-808996. He graduated in June 1943. He and Harper followed the same career. Went overseas to San Pancrazio, Italy, in 376 Bomb Group (H), 512 Bomb Squadron. On July 3, 1944, on he and Harper’s 50th mission, they were hit by flak over Giurgiu, Romania south of Ploesti. He and Robert bailed out. They were P.O.W.s for 67 days. They were released together through Turkey and Egypt. He returned to the States to fly B-25’s. He became a navigator (S/N: O-706526). He was with the 308th Bomb Gp. 373rd Bomb Sqdn. He was KIA July 18, 1944. See Selman Field During WWII, by Turner Pub’l Co., per Steven Burris. Paul Walker was his instructor at Douglas. He had Basic at Gunter Field, graduated from Spence Field, S/N: O-808263. He served in the P-38 Lightning formation in the 347th Fighter Gp., 70th Fighter Sqdn in the Pacific Theatre and was in action at Makin, Tarawa, the Bismarck Archipelago, the North Solomons, New Guinea and the Phillippine liberation campaign. He flew at least 96 combat missions. He was recalled for Korea and served as a Test Pilot. S/N: O-809001. He was in the 465th Bomb Gp. 780th Bomb Sqdn. On July 26, 1944 he was co-pilot on a B-24H (S/N: 42-52482) on a mission to Voslau, Austria. Just after reaching the target, the plane was hit by flak, and it started to descend gradually. Hooper was hit and was dead or unconscious. The pilot tried to crash land the plane, but hit a tree and both the pilot and Hooper were killed. He was buried in a small town called Lövö, Hungary, about 40 miles south of Shopron, Hungary (MACR #7336). Paul Schlundt was his instructor at Douglas. S/N: O-808266. 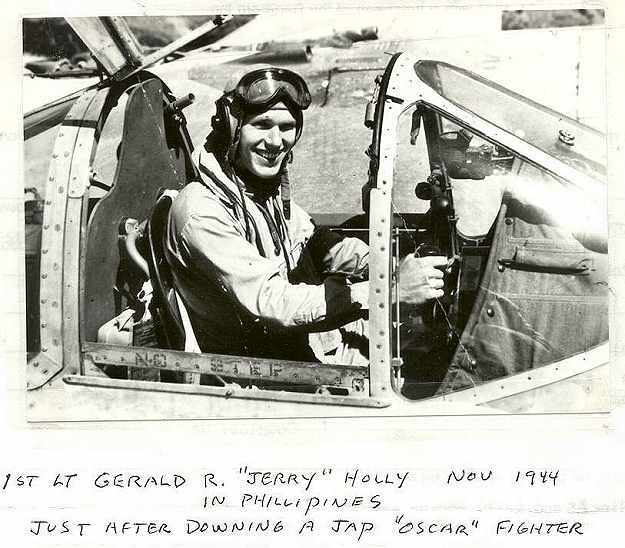 He graduated from Spence field, Moultrie, GA on July 24, 1943 and flew in WWII and again in Korea. He spent some time in the Reserve. He retired as a Capt. He then was in Real Estate. He also spent 5 years as a Tour Guide at Hoover Dam. Paul Schlundt was his instructor at Douglas. He soloed Feb. 16, 1943. He had Basic at Gunter. Graduated from Spence Field, S/N: O-808267. He was a B-29 pilot in the 6th Bomb Gp. 24th BS (VHB), bombing the Japs from the Mariannas. His plane was named “Ernie Pyle’s Milk Wagon”. Then he spent 6 months as a Twin Instructor at Blytheville, and some time at Goldsboro, N.C., Boise, Idaho and Seymour-Johnson in Indiana. Paul Schlundt was his instructor at Douglas. He washed out at Douglas because of depth perception. He became a Tail Gunner with the 8th A.F. in England. After the war he became a Fuel Engineer, designing furnaces. “Snow” White was his instructor at Douglas. He washed out in Basic. “Snow” White was his instructor at Douglas. He graduated from Spence Field, S/N: O-808269. He was with the 404th Fighter Gp. 508th Fighter Sqdn., per Leap Off: 404th Fighter Group Combat History by Wilson, Andrew F., Ed. “Snow” White was his instructor at Douglas. Click here to see a picture of him with his friends, Featherstone and Johnson, at Douglas. “Snow” White was his instructor at Douglas. S/N: O-809003. He was with the 302nd Bomb Gp. 356th BS Replacement Training Unit (B-24J). He was killed in a flying accident on Oct 18, 1943 (in NM), per Steven Burris. “Snow” White was his instructor. He washed out at Douglas. Lieutenant Col. Bill Dillard was his instructor. 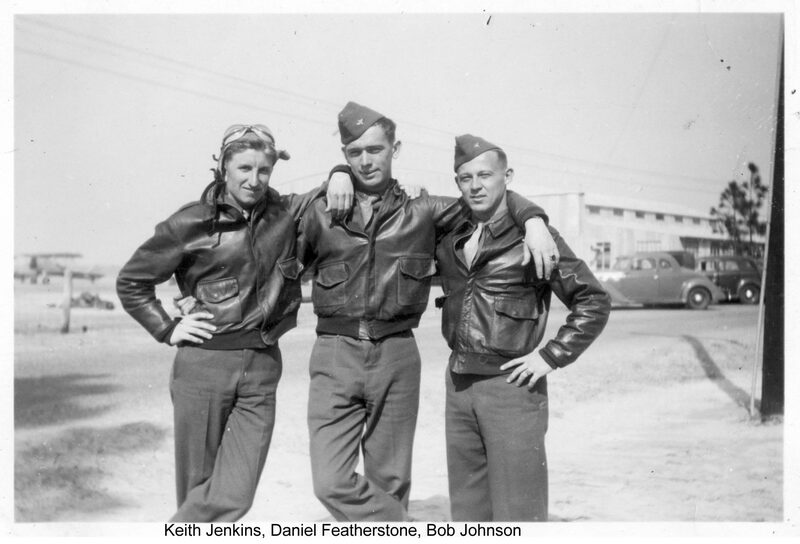 Click here to see a picture of him with his friends, Jenkins and Featherstone, at Douglas. Bill Dillard was his instructor. He washed out at Douglas. Bill Dillard was his instructor. He graduated from Spence Field, S/N: O-808275. 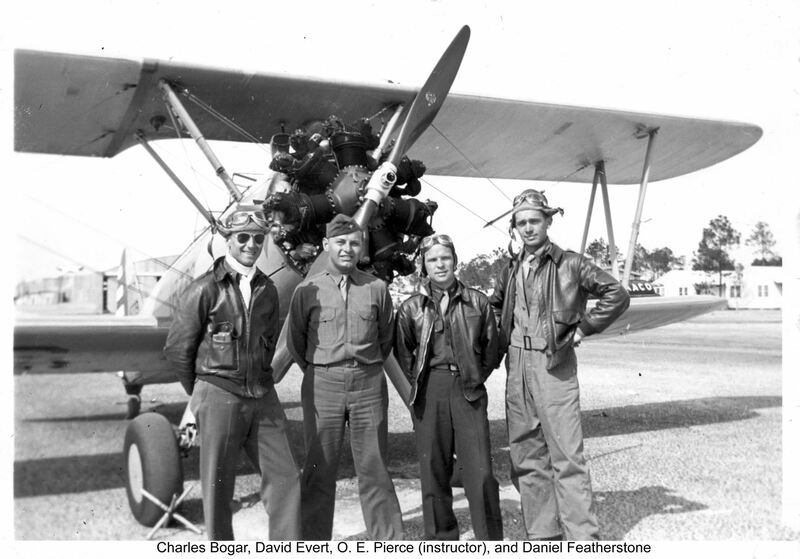 Later was a target Tow Pilot at Charleston, S.C.
Dan Lardin and then Treadaway were his instructors at Douglas. He graduated from Spence Field, S/N: O-808276. He was with the 405th Fighter Gp. 509th Fighter Sqdn. He flew P-47’s in Europe. Lardin and then Treadaway were his instructors at Douglas. He washed out. John D. Lardin and then Treadaway were his instructors at Douglas. He went on to Gunter and Spence fields for Basic and Advanced training. During advanced training gunnery practice, another plane collided with his over the target. He had to bail out of his badly damaged plane, and as he struggled to get out of the crushed canopy, his parachute released and drew him back to the tail wing. The tail wing sheared off his leg, but he managed to hold his hands around the bleeding stump to slow the blood loss. After he landed, civilians quickly drove him to a hospital where he recovered, minus one leg. Born 25 October 1918 in Morenci, Lenawee, Michigan. He died 8 October 1984 in Jackson, Michigan. Walter Huffmann was his instructor at Douglas. He graduated from Spence Field, O-808286. He was flying B-29’s. He was in a crack-up while instructing in Texas. After his service he returned to Detroit. of Detroit, MI. He died in 1979. Walt Huffmann was his instructor at Douglas. S/N: O-808287. He was with the 51st Fighter Gp. 16th Fighter Sqdn. in the China-Burma-India theater. Walt Huffmann was his instructor at Douglas. He was washed out. Mike Sewell was his instructor at Douglas. He was washed out. Mike Sewell was his instructor at Douglas. He washed out. Sewell then Tom Doran were his instructors at Douglas. He washed out. Mike Sewell was his instructor at Douglas. He became a bombardier See Bombardier – A History (Vol. 1) by St. John, Philip A.
Cadet Officer: Commander Squadron C.
Mike Sewell was his Instructor at Douglas. He had Basic at Günter and Advanced at Spence Field, S/N: O-808290. He then flew P-40’s and P-47’s in the 9th Air Force, 405th Fighter Gp. 509th Fighter Sqdn. Later he flew jet fighters. Tom Doran was his instructor at Douglas. He washed out. He graduated from Spence Field, S/N: O-808292. He became a bombardier, S/N: O-753146. He was with the 385th Bomb Gp. 548th Bomb Sqdn. On Sept 12, 1944 he was bombardier on a B-17G (S/N: 42-31638, “Big Gas Bird”) on a mission to Leipzig, Germany. His plane was shot down by enemy anti-aircraft fire shortly after “Bombs away”. He had a sprained or broken ankle before the plane crash-landed. Some of the crew were captured, but he was killed, possibly by German farmers (#8907). Charles Compton was his instructor at Douglas. He graduated and flew p-40’s for about 100 hours. Then after a bus accident he was sent to Walterboro where he flew P-39’s. Then with the 9th A. F. 405th Fighter Gp. 509th Fighter Sqdn. in England and flew P-47’s for 78 missions. After the war he became an Engineer and designer and worked for Air Research followed by Lockheed. Compton was his instructor at Douglas. He was eliminated. He washed out in primary. He was with the British Army in Burma. Click here for his letter describing his life (a PDF). Compton was his instructor. He washed out in Basic. Wayne North was his instructor at Douglas. He washed out. Buried SpringCreek Memorial Cemetery, Oklahoma City, OK. He was in the 392nd Bomb Gp. 578th Bomb Sqdn., per Air Force Assn. Directory Of Members 2001. He flew 30 bombing missions – his second being D-Day. 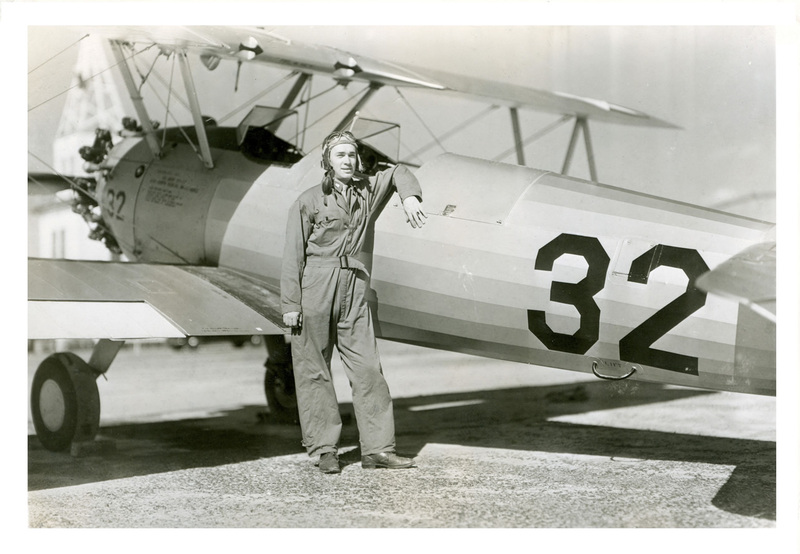 He also moved to another base in England after his 30 missions and flew tow target planes, A20s and others. Most of his career spent as Department Head of Aviation Technology. He founded the department at Purdue University in West Lafayette, Indiana. Paul Schlundt soloed him at Douglas Feb. 24, 1943. North and Treadaway were his instructors later. Student Officer: 1st Lt. at Douglas. Graduated from Spence Field, S/N: O-806297. He was in Richmond AAFd Combat Crew Training Station-F (P-47C). He may have been injured Nov. 25, 1944 (in VA). He had basic at Gunter, and graduated from George Field. He was at the 397th Bomb Gp. HQ and flew B-26’s in England and France for 50+ missions. He made the Air Force a career. S/N: O-809018. He flew B-24’s with the 34th Bomb Gp. 007th Bomb Sqdn. 1944-09-22 POW LS-1. He was in Stalag Luft 1 in Barth, Germany and was freed May 1945, per Behind Barbed Wire, by Morris J. Roy, 1946, the POW web site of the National Archives, and The Garfieldian (newspaper), June 28, 1945. S/N: O-808299. He was in the 405th Fighter Gp. 509th Fighter Sqdn. He was killed in action July 24 1944, per various sources. Ben Epps was his instructor at Douglas. He was at the Lake Charles (LA) AAFd Combat Crew Training Station-B (TB-26C). He was killed in a flying accident Oct. 16, 1944, per Steven Burris. Charles Sherrill was his instructor at Douglas. He was in the 467th Bomb Gp. 791st BS flying B-24’s. Click here for a photo of him with his crew. Charles Sherrill was his instructor at Douglas. He was in the 445th Bomb Gp. 701st Bomb Sqdn. On June 27, 1944, he was pilot of a B-24H (S/N: 42-95280) with a crew of 10. The front of the plane received a direct hit of flak. The windshield glass was blown into the cockpit, and flak hit Miller in the leg. The plane caught fire immediately. All bailed out over Angicort, a village north of Creil, but one of the crew’s chutes did not open. Four of the crew died. Miller landed safely but was unable to travel. The plane blew up in the air. He managed to evade capture and was eventually returned to duty (MACR #6731). He became a bomber / navigator. Recon squadron. See Bombardier – A History (Vol. 1) by Philip A. St. John, 1993. Charles Sherrill was his instructor at Douglas. S/N: O-809026. He was in the 492nd Bomb Gp. 857th Bomb Sqdn. 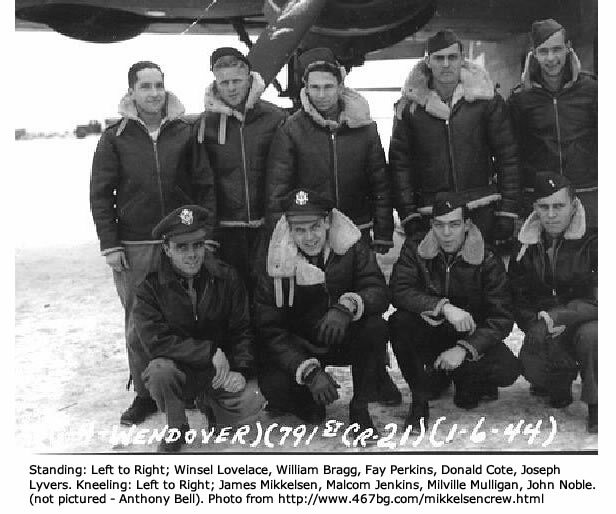 On May 19, 1944, he was the pilot of a B-24J (S/N: 42-110151) with a crew of 10 on a mission to Brunswick, Germany. His plane was attacked by 50 ME-109’s and FW-190’s. The plane dropped out of formation and exploded a few minutes later. The ship probably blew up before he had time to bail out, and he was listed as MIA and later as KIA (MACR #5241). (Find-A-Grave: He and his fellow crew members who were killed have a marker in Arlington National Cemetery. S/N: O-808308. He was in the 350th Fighter Gp., per Steven Burris. 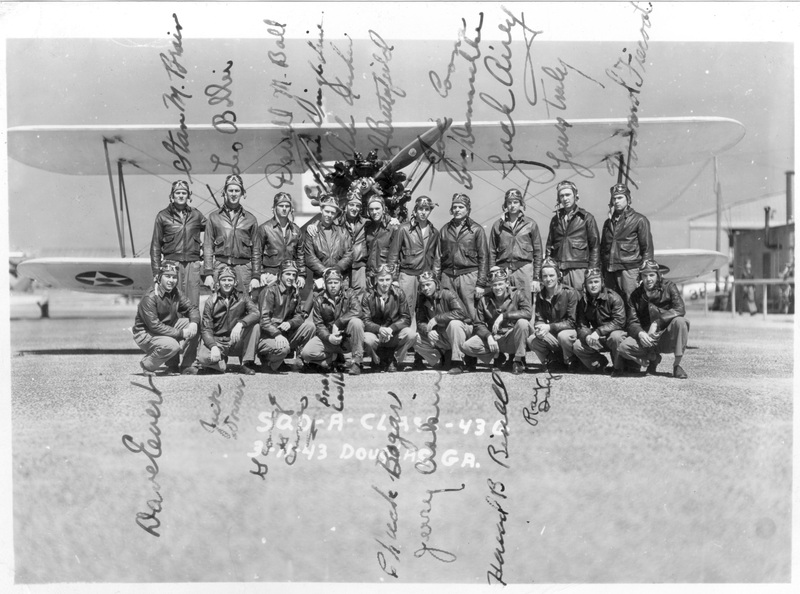 Student Officer: Second Lieutenant, Squadron B at Douglas. Graduated and was a pilot. After the war he worked at Good Housekeeping, in the advertising industry, owned European Motors car dealership, and then worked as a manufacturer’s representative. Buried in the American War Cemetery Margraten. S/N: O-808732. He was in the 366th Fighter Gp. 389th Fighter Sqdn. Student Officer: First Lieutenant, Squadron C and Wayne North was his instructor at Douglas. He washed out. S/N: O-808742. He was in the 371st Fighter Gp. 405th Fighter Sqdn. He was killed in a flying accident Apr 12, 1944 (in England), per Steven Burris. S/N: O-1699039. 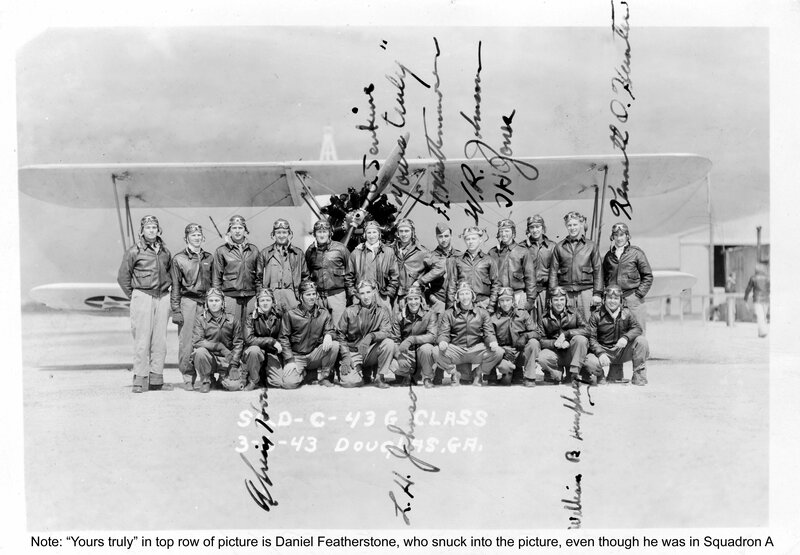 Student Officer: Second Lieutenant, Squadron D at Douglas. He was in the 405th Fighter Gp, 410th Fighter Sqdn. On July 30, 1944 his squadron was performing a strafing mission in the vicinity of Avranches, France. His plane (a P-47D, S/N: 42-76392) crashed and he was killed. He was buried at La Cambe Cemetery, France (#07929). He was a graduate of George Field (S/N: O-809052). He was a co-pilot being trained to fly the B-17 at Lockbourne Army Air Base located near Columbus, Ohio and on the 22nd of September, he and the rest of his crew were involved in a crash-landing at the base. There does not appear to have been any fatalities. He was a career USAF officer by 1968 and held the rank of LTC. 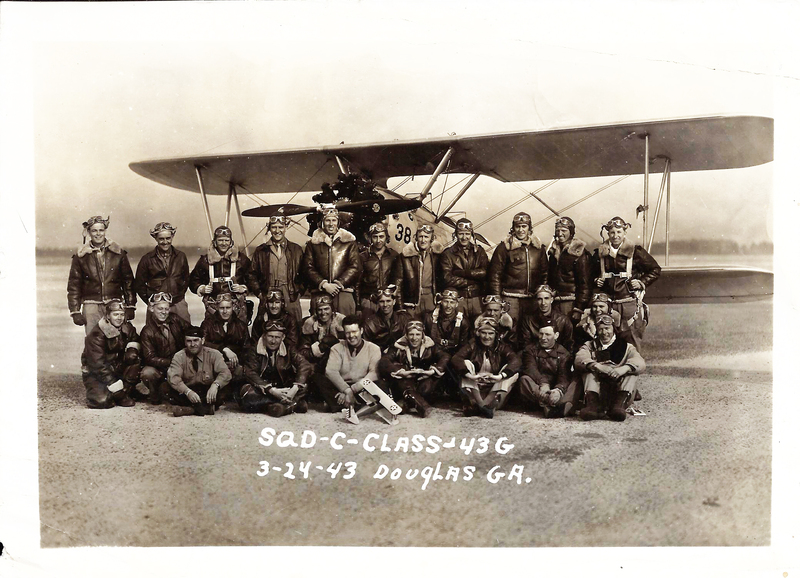 Student Officer: Second Lieutenant, Squadron D at Douglas. He was at the Hondo AAFd Navigator School 2523rd AAF Base Unit. Cadet Officer: Commander Squadron D at Douglas. 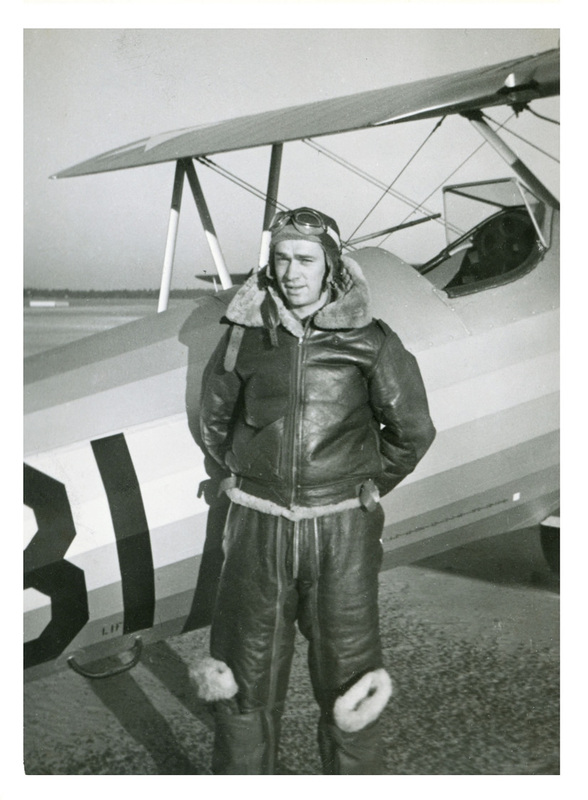 Student Officer: First Lieutenant Squadron A and Charles Sherrill was his instructor at Douglas. Cadet Officer: Wing Commander at Douglas. He became a navigator. See Selman Field During WWII, Turner Pub’l Co. He was with the 362nd Fighter Gp. 377th Fighter Sqdn.